The Yellow Cape Cod: Home Depot Do-It-Herself Workshop~And a Giveaway!! 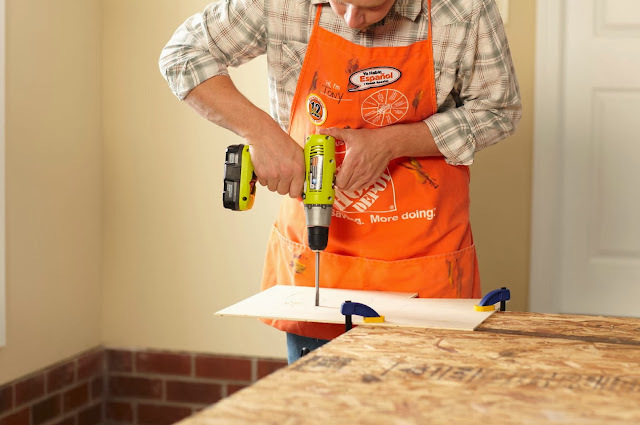 Home Depot Do-It-Herself Workshop~And a Giveaway!! This Post and giveaway is sponsored by The Home Depot, all opinions are my own. Please see below for additional disclosure. The Home Depot has teamed up with Mrs. Do-It-Herself, Martha Stewart Living, for a Pinterest Inspired workshop. And, guess what? They have asked me to get in on the fun! (Stay tuned at the end of this post for an awesome giveaway) Using some pretty cool new tools, I designed and will be creating a custom monogram wreath and sharing step-by-step instructions in a video tutorial. The fabulous wreath shown here was made by The Home Depot. You'll have to stay tuned to see the version I came up with. The Home Depot is hosting a free in-store Do-It-Herself workshop November 21, 2013 from 6:30-8:00pm. The Home Depot has expanded their free Do-It-Herself workshop locations. Check your local The Home Depot store to see if it’s holding Do-It-Herself Workshops. With clear instructions, plenty of time for questions and answers and a wonderful demonstration, Do-It-Herself Workshops will give you a dose of do-it-yourself “Pin”spiration. I will be co-leading the Do-It-Herself Workshop locally here in the Detroit area. A fun evening of seasonal projects and power tools. I can't think of a better way to kick off the season. Come and see why Do-It-Herself Workshops are worth the trip! Informative and easy to understand, the associates leave no questions unanswered. 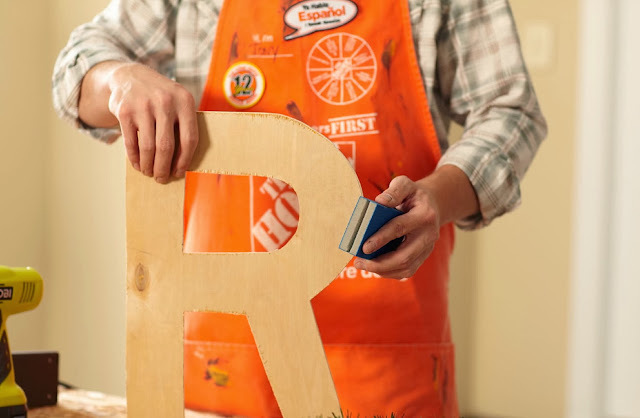 You can deck your door and get the whole family involved to learn how to make a homemade monogram wreath at The Home Depot. 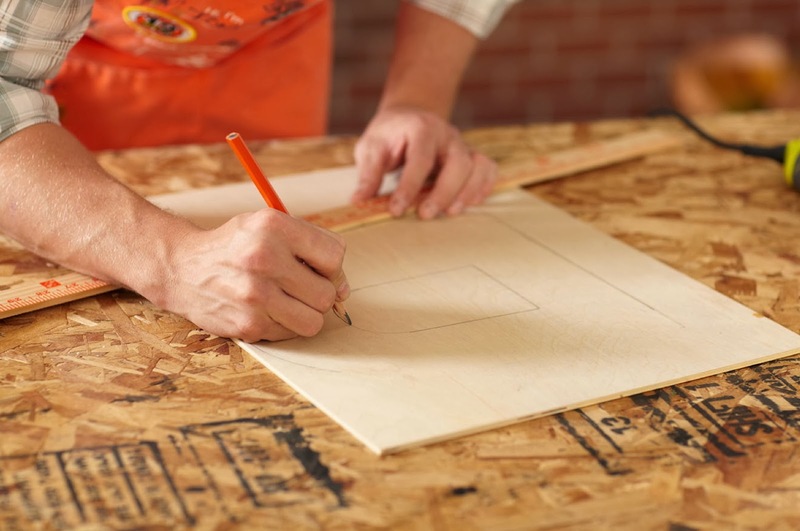 Register here for the November 21 DIH Workshop in your area today! Stay tuned to see my spin on the monogram wreath in a video tutorial sometime during the week of Thanksgiving. I will also be sharing photos from the Do-It-Herself event I'm co-leading locally. Register online for The Home Depot DIH Workshop in your area on November 21, 2013 (http://bit.ly/RegDIH). To enter to win a $100 Gift Card to The Home Depot, leave a comment below. Tweet or share this post on facebook for additional entries. Please don't forget to leave your email in your comment so I can contact the winner! Love this! I shared it on Facebook! Can't wait to see your wreath!!!! What a great DIY project for the holidays, and even better excuse to hang out with my gal pals! I have always been nervous to take these classes- but they look great! Maybe I will signup for the do -it- herself class! I love Home Depot! Thanks for this monogram idea. GREAT!! I have several DIY projects planned! Eager to investigate the in-store classes!! Love it! Great idea! I shared this on Facebook. I like DIY workshops, great chance to learn and be creative. That's so neat! Love Home Depot! I'd love to win. Fun project! Thanks for offering the giveaway. 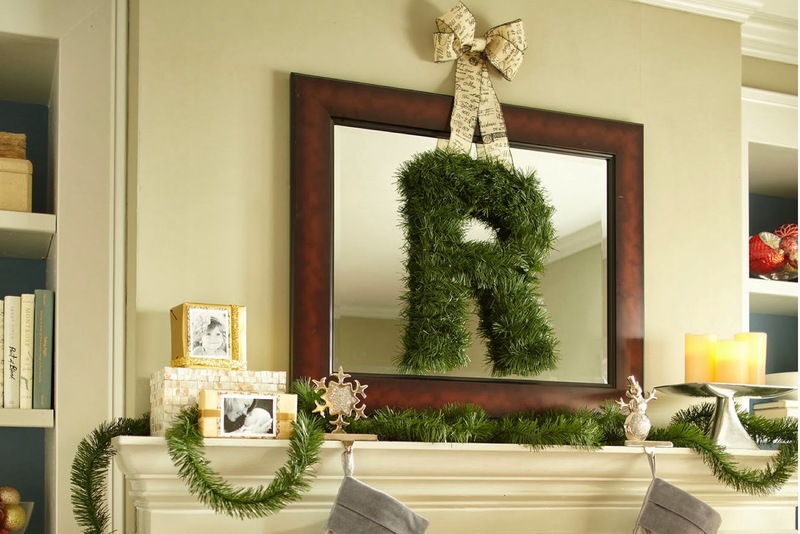 Monogram wreath is a nice idea! But I probably have some painting to do - need one of those crazy foldy ladders to get up in the stairwell! Winning a Home Depot gift card would be wonderful! Thanks for the opportunity. I forgot to leave my email! You may contact me at monicahjeffers@yahoo.com. Thanks. I forgot to leave my email, monicahjeffers@yahoo.com! Thanks. Love it...can't wait to take the class! I love the Letter wreath - so pretty! The Home Depot card would be wonderful as we are slowly working on finishing our basement. thanks! My husband would love a shopping spree at the Home Depot! So many possible projects...so little time! LOL LOVE LOVE my local Home Depot! I really want to make a wreath like that for my front door! Thanks for sharing! all of your creative ideas to help beautify our lives and our homes. We love to shop for home needs at the home depot...thank you for the chance. Wow! Love it. Home Depot was one of my son's first words - Bopo. =) We are always making trips to get things as we are always remodeling something. When we were renovating I spent half my time in Home Depot! Such a great store. Love this! Thank you for the opportunity. mymoskwiak at gmail dot com. pamalee123@hotmail.com would rather shop at The Home Depot than at the mall anyday! What a perfect project for this time of year! I love your wreath idea. Thanks for sharing, and for the chance to win! Thanks for the great giveaway! Email is in my profile! This is such a fun craft and one that I could do! Would love a home depot gift card to make it happen!! What a cute idea for the holidays! Thanks for the chance to win! I go to HD all the time! Would love to win! Im registered! I cant wait!! This is all new news to me, I've signed up for the workshop at our local Home Depot, so looking forward to it, THANKS for the post. Time to get ready for the cold season here in Mississippi. I like the project. This is so awesome-----I always get frustrated when trying to use my husband's tools so this is perfect! Shared with my girlfriends so we can all go and make it a night out!! I love home depot - and this DIY project is super cute! I love DIY projects but my skill set is not up to some projects I'd like to do. I'll have to keep an eye out at Home Depot for a workshop! I just found out we will be moving in December, so this would be wonderful to win! What a great project! Love it. I really like this wreath, it's a nice idea. I registered the for workshop! Thank you so much! Home Depot is the only store we shop at for our home improvement needs! We are DIY-ers and would love a home depot card. Always LOVE your blog too!! LOVE your blog, it is always and inspiration. Would love the Home Depot Card too!! I love all the DIY ideas at Home Depot. What fun!!! I am heading out to Home Depot tomorrow!! Heading to home depot tomorrow-off for Veteran's Day and I have a ton of projects to start!!!! I signed up for their Power Tools class! Oh that custome monogrammed wreath is so beautiful!!! I would love to make one too! We just moved to a new area and just bought a new house. We have already stopped in the Home Depot for a few things, and we have many more trips ahead of us. It looks great! I would love to be entred for this giveaway. Thanks for the giveaway! What a great Christmas gift this would be for my DIY hubby! I'll bet I could get him to make the monogram for me if I won! My husband loves Home Depot! I love The Home Depot! Thanks for the giveaway. Beautiful! Sounds like a girls night out to me! Thanks for the chance! Which store are you going to be at? I'm in Royal Oak...which I think is near you. Awesome giveaway. I love The Home Depot! I am sending this out on FB. Registered for the 21st too. yay! I love your decorating style and your website! I registered for myself and am also bringing my ten year old daughter. great ideas from you and Home Depot!! The wreath is perfect! Hope my store is offering this class! Can hardly wait to get to my Commerce Twp. Home Depot for this workshop. Hope to meet you there. I love the wreath and Home Depot! Love the monogram wreath!!! Fingers crossed!!! I had no idea they had Do it Herself Worshops. I signed up for tonight! Love The Home Depot. The monogram wreath would look good on my mirror above the entry console. Awesome project! Thank you for having the giveaway! Home Depot is a great place for Christmas decor too! I won't be able to make the DIH Workshop tonight but I'm going to register for the next one.